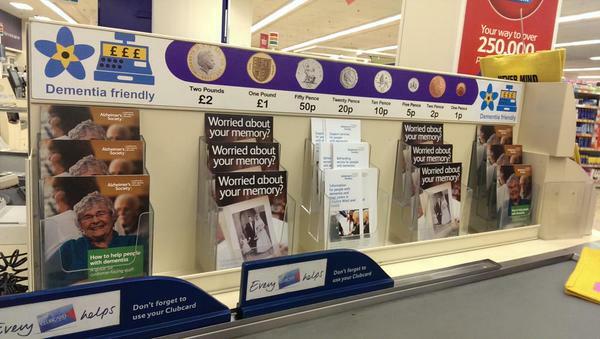 'Dementia friendly' checkouts: more than a fad? Tesco and Asda are two of the stores which have introduced ‘dementia friendly checkouts’ in supermarkets according to two reports. Both reports refer to ‘training’ even though the Alzheimer’s Society state clearly ‘Dementia Friends’ is about information sessions, not training Both reports refer to the ‘Dementia Friends’ programme and the Alzheimer’s Society. I myself am a ‘Dementia Friends Champion’, and indeed I am due to give an information session at BPP Law School next thursday (details here). Dementia Awareness Week was about sharing wider knowledge about dementia, rather than promoting the Alzheimer’s Society solely though the Alzheimer’s Society should be congratulated for giving the week momentum; and the the success of this, arguably, is reflected in the diversity and quality of tweets using the hashtag. Alzheimer’s Research UK came up with an intriguing idea – the auction of hats to raise money for research into dementias. I myself know recipients of these grants, and the work invariably is outstanding. We must be keen to promote research into care as well as cure, however, and this needs the correct political lead. Of course, by doing ‘Dementia Friends’ you’re not supposed to be “locked in” to working only as a volunteer for the Alzheimer’s Society. There is no such exclusivity requirement. And there’s no better time than now to campaign for dementia, such as the petition here against Hull Clinical Commissioning Group in their short-sighted decision not to commission Admiral nurses (a type of clinical nurse specialist for dementia). The ‘dementia friendly communities’ policy tranche is indeed global, and spearheaded by a number of protagonists, including Innovations in dementia and the Joseph Rowntree Foundation. At a time when there is still much stigma and prejudice against dementia in society, the aim was to provide an environment which was conducive for people living with dementia, friends or families to lead fuller lives. This is, of course, a very laudable policy aim, and involves not just the health and care systems, but the wider ‘social determinants of health’ such as retail and banking, housing and transport. It is worth at this point considering the irony of the approach of ‘dementia friendly checkouts’ in the context of the ‘Dementia Friends’ programme. One of the five key messages of this information session programme is that ‘There is more to the person than the dementia’. 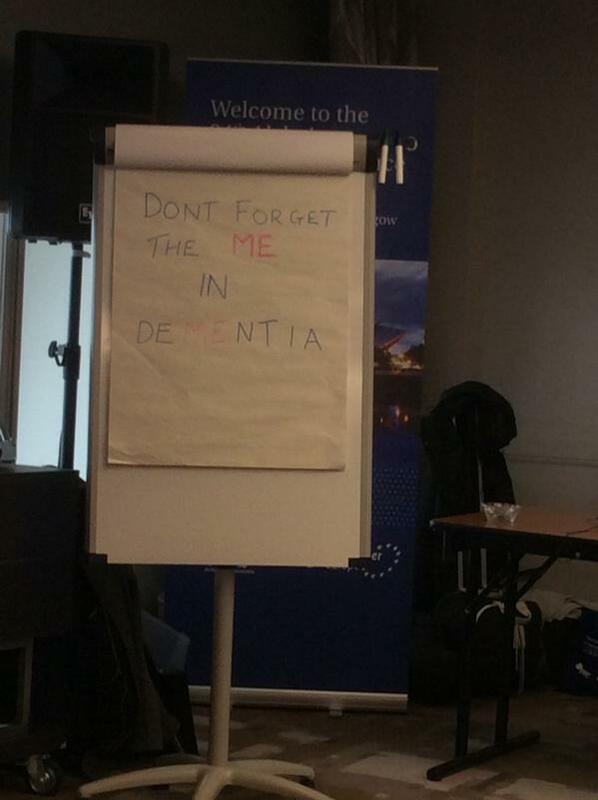 This was explained to me last year in Glasgow by Joy Watson as “putting the ME in deMEntia”. The issue is that in person-centred approaches in dementia post-diagnostic care and support people aren’t defined by a label. For example, you should be very careful about the use of the word ‘elderly’. There are some NHS Trusts that define ‘elderly’ for the purposes of their acute medical take as patients above the age of 65; others above 85. And, as Chris Roberts said to me once, the differences between people aged 55 and 65, 65 and 75, 75 and 85, can be big or small. We all know 68 year olds who appear quite ‘frail’ but 85 year olds who appear quite ‘spritely’. But the issue is that, as far as commissioning is concerned in the NHS and the voluntary sector, things tend to get defined by their labels, such as new ‘million pound frailty units’. I’ve seen it before – that policy based on fashion or trends invariably ends in tears. I think if you chat with people what they think about supermarket checkouts you will get a proportion of people who report that they’re chaotic stressful places. Many people without dementia dislike them. I in fact dislike them, not living with dementia; which is why I buy my shopping online. I also don’t know many people who meticulously count their coins in paying for their weekly shopping, so huge banners with coins may not help. People living with dementia often describe members of the public raising the volume of their voice at them as if they’re ‘stupid’. It could be that you have problems in recognising the shapes of coins. This is called a ‘visual agnosia’. I know the late Sir Terry Pratchett described not being able to recognise a 50p coin from its shape, which is a touch form of the same cognitive condition, called ‘tactile agnosia’, which can signpost a diagnosis of ‘posterior cortical atrophy’ type of dementia. Again a big banner won’t help. And for people with classical Alzheimer’s disease their long term memories will be very good as opposed to their short term memories. A more appropriate term for examples such as the ‘dementia friendly checkouts’ might be ‘dementia inclusive communities’ – and this is indeed keeping with rights-based advocacy, where stakeholders uphold their equality (and for the time being human rights) rights under the law. But there maintains for me, and many others, this stubborn strand in policy in whether it is in fact creating inclusivity or ‘otherness’ for “people with dementia”? “People with dementia” is a homogenous term which is not only an injustice to the hundred or so different types of dementia but also an injustice to the 47 or so million people living with dementia all with different abilities in cognition. ‘People with dementia’ are most likely to have cognitive disabilities more than ‘people with bowel cancer’, but one must be mindful of the fact one would think twice about having a special shopping aisle for people with operated bowel cancer (for people with colostomy bags). Of course, the argument is at risk of getting utterly ridiculous. But this issue became very vibrant indeed as one of the producers of the film “Still Alice” asked the people living with dementia in a crowded lecture theatre in Perth, Western Australia, to stand up to identify themselves. The general ‘feedback’ is that this stunt was generally felt to be rather humiliating, and Kate Swaffer, Co-Chair of the Dementia Alliance International (DAI), received a number of complaints about it. The DAI is the leading international group consisting only of people living with dementia. We are in a different place with stigma and dementia to where we were with physical disability, possibly. I am physically disabled, so I feel “within my rights” to discuss this. Many people find the word ‘disabled’ and being in a wheelchair “empowering” – many disempowering. You can take your pick as to whether people with dementia want to be identified in a separate shopping aisle in a public supermarket. But this criticism is not one which I have intended to level at proponents of ‘dementia friendly supermarkets’ – it’s simply a wider policy observation as to whether, yet again, the policy promotes inclusivity or otherness. There will be people who believe that ‘all publicity is good publicity’, but you can unfortunately have the wrong type of publicity (like the wrong type of snow). And all this does matter if we are to bridge the lived experience of all people who’ve received a diagnosis of a dementia and what the crude policy levers are trying to achieve. I do, however, wish to thank the people behind ‘dementia friendly checkouts’ for their excellent work.